This is the most basic, yet extremely essential, simple action that you must get used to. After whatever you are doing, wherever you are and whenever it is, save before you proceed. This simple act is especially important during dungeon quests. After every 'horde' of enemies, after every turn (maybe not THAT extreme), SAVE. You wouldn't want to go all the way to the end, only to die under the final 'boss', would you? It's okay if you are too lazy to explore all of Skyrim by foot. 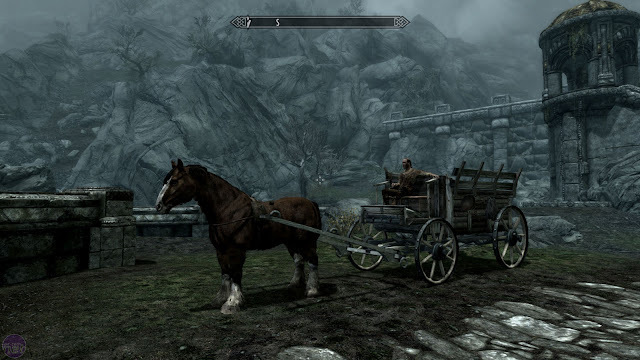 Find a carriage just outside a town and instantly travel to the town you want. Do note that only larger towns are available though. Before I mislead you, no, no one in the world of Skyrim, or even in our world would train you for free. All trainers would of course charge you a sum of money depending on how many times you trained from them, but after all the training you got, you can always steal your money back right? ;) Yep, and that's the simple trick. Well yes it's kinda exploiting the game's rules (read: glitch) but you know, who cares, we live in a free world now. However, only train once before you pickpocket as the more money you give him, the more money he has and the lower the percentage for you to successfully pickpocket. Also, do remember to save before you do the act - you wouldn't want to go to jail just for a skill level would you? With that, you can basically pickpocket any other character in the game, but do note that you would only want to pickpocket items which cost at least a 120 gold because any lesser will not improve your pickpocketing skill efficiently. Killing a dragon with extreme ease. Sometimes, dragons can be tedious to kill and you may just want to take a shortcut. Well, one thing you may notice is that you can always manipulate the many characters in your surrounding to help you. Get your dragon to the nearest fort, bandits camp or even the mammoths/giants area and you can consider your dragon killed. However, do note that you may not want to inflict any damage to your 'temporary companions'. Next time you store your stuff in a random chest, wardrobe or even a barrel, think again. The things you put in there are only temporary and will disappear after a day or two. Therefore, you will want to get yourself a house and store all your belongings in the chest. Or, you can choose to use your companion but remember that if he/she dies, you will need to carry all the item again. Lydia, arguably the best companion in the game. Not only will they carry your items and inflict more damage, but also take the damage for you. And to return the favour, I say you appreciate their contribution and protect them, as they do for you all the time. Everytime your companion loses too many health, he/she will go into a 'suffering' mode and the AI will not target them anymore. However, this does not mean that they will never die. Though they are not the AIs focus anymore (it's you the AIs want to kill now), they are still as vulnerable as ever - a stray arrow or some magic in the area would kill them instantly. To prevent this from happening, lure whatever it is attacking you away and your companion will be back up in a minute or two. Basically, you will notice that there will be no option for you to sell stolen items to the usual shopkeepers and there are no speech perks to unlock that skill (they should!). So, the only way you can sell it is of course, in the 'black market' in Riften. I can try to explain it here by words but I think it would be better for you watch the video below for a clearer idea.